Neue Schule Hamburg (English: New School Hamburg) is a private Sudbury school in Rahlstedt, Hamburg, Germany, established in 2007. The school was founded by Philipp Palm, who was the school's principal, his partner the German popstar Nena Kerner, Silke Steinfadt and Thomas Simmerl in September 2007 in Rahlstedt with 85 pupils and six teachers. It was the first school in Germany to be organised on the Sudbury school concept. Setting out her rationale for helping establish the school, Nena referred to her own "uninspiring" education, explaining that, "When I was a child, like all children, I had so many ideas and so much curiosity. I wanted to take on the world but the teachers were the ruling force. That doesn't encourage children; it represses them." During the first year, there were reports of theft and violence at the school. However, after three years, it was recognised by the Hamburg school authority as a state-approved substitute school (German: staatlich genehmigte Ersatzschule), and the Hamburg school authority agreed to contribute to the running costs from 2011. In 2010, the school had increased the number of teachers to ten. ^ Kosog, Simone (20 September 2010). "Lernen ohne Zwang – In der "Neuen Schule" in Hamburg sollen sich die Kinder ihre Bildung selbstständig erarbeiten – die Einrichtung hat prominente Fürsprecher". 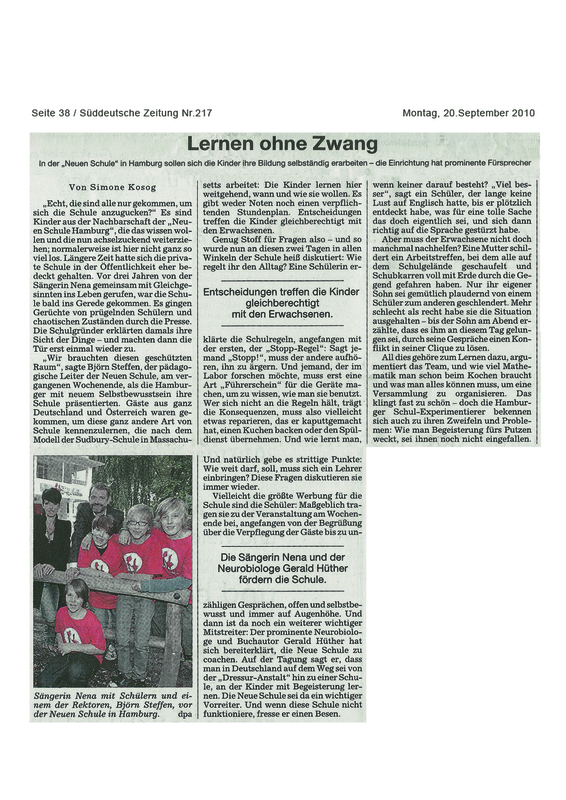 Süddeutsche Zeitung. Archived from the original on 20 July 2011. Retrieved 1 February 2011. ^ a b Schoener, Johanna (31 December 2010). "Große Freiheit – Was macht eigentlich die von Popsängerin Nena mitgegründete Neue Schule? Eine Innenansicht". Bildungspolitik. Zeit Online. Retrieved 1 February 2011. ^ a b Gall, Insa (26 March 2008). "Gewaltprobleme an Nenas Privatschule". Welt Online. Axel Springer. Retrieved 1 February 2011. ^ a b "Neue Schule Hamburg startet – Das Besondere an der von Pop-Sängerin Nena mit ins Leben gerufenen Schule: Jedes Kind lernt, was es will, wie es will. Am Montag geht's los". Nachrichten. Hamburger Abendblatt. 30 August 2007. Retrieved 1 February 2011. ^ Smee, Jess. "Singer Nena takes a pop at school system". theguardian.com. Guardian News. Retrieved 29 June 2018. ^ "Nenas Privatschule erhält Geld von der Stadt – Als Privatschule hatte sich die Neue Schule in den ersten drei Jahren selbst finanzieren müssen. Vom kommenden Jahr an gibt es Zuschüsse". Schule. Hamburger Abendblatt. 17 September 2007. Retrieved 1 February 2011. This article about a Hamburg building or structure is a stub. You can help Wikipedia by expanding it. This page was last edited on 20 January 2019, at 15:27 (UTC).